When it comes to outdoor adventures, there is nothing better than heading to the Pocono Mountains. The views are stunning and there is always something different to see while you are here. In any season, our area can give you a very different view but one that is thrilling, and we at Ledges Hotel highly recommend, is taking a tour where you zip line in the Poconos. It is a way to see the most of our area in the shortest amount of time. There are many ways to go zip line in the Poconos and a couple of companies that we recommend that strive to give their guests the best experience. Let’s have a look at what you can expect when you book a tour and zip line in the Poconos. First up is The Adventure Center at Skytop Lodge. Located just 36 minutes away this is the closest of your options to go zip line in the Poconos. Their zip lining tour takes about 3 hours and will take you about 3,000 feet in total. Don’t think that you will have an easy time with this one, it is truly adventurous. You will have to go over elevated bridgeways and logs to walk across, a cargo net and then 7 different zip lines. Trust us, you will be quite tired but proud at the end of this trip. Reservations are required and the cost for this tour is $45 during the week and $50 during the weekend. Tours start at 9 am and then on the half hour after that. Looking to have a day filled with adventure? Check out the other tours they offer. If you are looking to just enjoy an amazing zip line in the Poconos tour then we suggest booking one with Kittatinny. 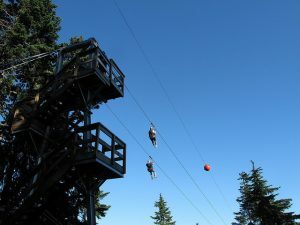 They have multiple zip lines where you can race your friend or loved one or just go a bit slower and enjoy the experience together. Their line is some of the biggest Big Zips in the country. You will drop a total of 36 stories by the time your tour is over and it takes about 40 to 45 minutes to complete. You will be zipping at a nice clip as well as most visitors travel an average of 40 to 60 miles an hour. Your trip will be entirely in NY and you will get to see the Delaware River as well as the drivers of Route 97. Be sure to wave at the cars! Be sure to make a reservation before you go as this is a very popular activity. Tickets for this zip line in the Poconos starts at $37 on the weekdays and $39 on the weekends. Prices go up to $77 on the weekdays and $79 on the weekends for those who want to do multiple trips. Be sure to check out all of the FAQs so you can have a good idea of what to expect while you are there. If you are looking to make a day of it with Kittatinny, be sure to check out the other tours and adventures they offer. As you can see, there is a lot of adventure to be had while you are here in the Pocono Mountains. When you do come, we hope that you will consider staying with us at Ledges Hotel. We have everything that any adventure seeking group could want. For those of you who just want a place to rest, we have economy sized rooms that while smaller are filled with all of the same luxuries as the other rooms. For those of you who are traveling in a group, we suggest sharing one of our 2 bedroom suites which give all of the guests plenty of personal space. Contact us today and let us help you build the perfect trip with one of these zip line in the Poconos tours!